You may have caught the snazzy video for "Time and Time Again" on MTV, as this hybrid band has had quite the auspicious debut. 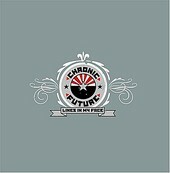 Upon first listen though, Chronic Future sounds like yet another bad version of rap rock, yet when digging a little deeper into this Arizona quartet's debut release, a lot more than just a generic, played out style is showcased. Surprisingly, there's a decent pop punk band la All American Rejects underneath the Eminem meets Ludacris lead vocals, and there's even shades of modern alternative rock a la Hoobastank and The Used here on tracks like "Thank You". Sounding like an updated, more street credible version of Sugar Ray, high schoolers that frequent the malls of America should eat Lines Up In My Face, as it mixes the best of MTV's TRL into a digestible package suitable for mass marketing success.